Cosplayers and comic book enthusiasts rejoice! 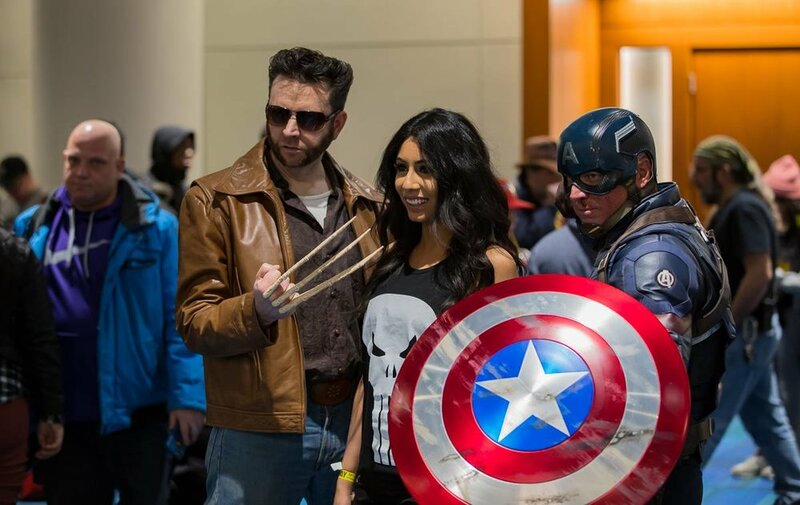 Fan Expo Canada is the biggest event of the year for all things sci-fi, gaming, pop culture and fandom, and it’s back, packing a wallop of glorious good times. Running from August 30 - September 2, Fan Expo will be held at the Metro Toronto Convention Centre (255 Front West). Go online for ticket and pricing information. big part of Fan Expo is the huge community of fans who attend in costumes, or cosplay. Attendants don all kinds of intricate, self-made outfits of different characters from both popular and niche films, television shows, video games, anime and more — all available for your viewing pleasure. It’s a fantastic opportunity to snap a few photos, go get a selfie with your favourite fictional character in the flesh, or even come dressed up yourself. Professional cosplayers are a thing, and will be onsite, dressed in different costumes each day, signing autographs and chatting with guests. Every year Fan Expo boasts a spectacular amount of celebrity guests from film, TV, and the internet. And this year is no exception with the timeless cast of Back to the Future — Michael J. Fox, Christopher Lloyd, Lea Thompson, and Tom Wilson — appearing for a rare reunion. Other talents attending this year include William Shatner (Star Trek), Karen Gillan (Guardians of the Galaxy), Steven Ogg (GTA V) and Evangeline Lilly (Ant-man and the Wasp). Meet & greets offer fans the opportunity to purchase autograph signings, photo ops, and attend panels with their favourite celebs. Playstation, Xbox, Nintendo and more have booths at Fan Expo where they let attendees play demos of the hottest upcoming video games before anyone else. Demos of Shadow of the Tomb Raider, Spider-Man, Mario Tennis Aces and the highly anticipated Super Smash Bros. Ultimate are expected to be playable this time around. Word of warning: make sure to get there early if you want to get some play time in as the line ups tend to get long. Additionally, there will also be an authentic 1980’s retro coin-op arcade worth checking out if you want be old school and go broke a quarter at a time out of frustration. The centre transforms into 400,000 square feet of shopping extravaganza. Over 800 diverse retailers, both big companies and chic boutiques, from all over will join Fan Expo to set up shop and sell their wares to attendees. Splurge on goodies like collectibles, comics, figures, clothes and all sorts of other cool gear from the sci-fi, horror, superhero and gaming genres. Every year, the show features a wide variety of exclusive collectibles available onsite and in limited quantities. These include original artworks, custom prints, and elusive comic book issues. Whatever you’re into you’ll find it at Fan Expo. Artist Alley is where independent and up-and-coming artists, writers and crafters can be found. Here you can peruse through all kinds of original artwork, graphic novels, handcrafted jewelry and more. The best part is that things here are affordable so show your support for indie creators making new content with a purchase or two. On top of that, you can also meet the big names who breathe life into popular stories with the expo’s lineup of legendary creators: Scott Snyder, writer of Justice League, Nick Spencer, writer of Amazing Spider-Man, and Charles Soule, writer of Return of Wolverine. Simply walk up and down the aisles of the convention floor and pop into any booth that peaks your interest. A plethora of companies join Fan Expo’s pop culture circus and bring their own rides, attractions and cool toys for people to play with. Plus, more often than not, they give out free stuff — and who doesn’t like free stuff? Family, kids, and even power-hungry villains — all are welcome to try out the interactive, in-booth experiences. Some of this year’s attendees include Hasbro, Warner Bros Pictures Canada, Space and Shudder.